Eagle Creek is unique among Naples, Florida, golf and country club communities. Near the intersection of Tamiami Trail and Collier Boulevard, residents have equally easy access to Naples and Marco Island. Eagle Creek is bordered on the south by the Rookery Bay Preserve and Research Center. The preserve stretches nearly five miles west to the Gulf Coast and seven miles south to Marco Island. No other community in the Naples are can make that claim. There are only 458 residences in Eagle Creek, nestled on 300 acres of cedar, palm, and pine trees. 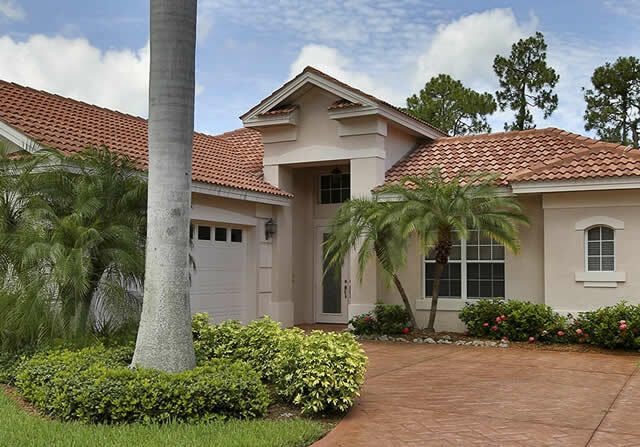 The pristine setting is incomparable in Southwest Florida for quiet, solitude, and convenience and a relaxed lifestyle. The community is comprised of neighborhoods of single-family homes, villas, and condominiums. There are 144 single-family homes in Eagle Creek Estates. These upscale homes have golf course, water, or preserve views. The majority have private, screened pools. Many of those feature a courtyard setting for their pools, creating an even greater sense of privacy and secluded luxury. Stonegate at Eagle Creek is home to 222 two-bedroom, two-bath, condos, each with assigned, covered parking and 1,258 square feet to 1,900 square feet of living space. Eagle Creek Villa Homes are single-story, ranch-style, duplexes with 1,800 square feet or more. Each villa has a two-car garage. With a limited number of resident-members, access to tee times and the other club amenities seldom involves a wait. While others are waiting for a seat at one of Naples many restaurants, Eagle Creek residents can sit down to a relaxing meal with floor-to-ceiling outdoor views from each dining room in the main clubhouse. The Main Dining Room it a picture of elegance and style, where the finest cuisine is always on the menu and the professional staff is at your service. The Grill Room is casual. It has the style of an upscale sports bar. A wide selection of menu items is available. The Cypress Room matches the elegance of the Main Dining Room, but it gets used for private occasions and has a flexible layout. Eagle Creek is known for golf but tennis and other sports are well represented here, too. The tennis facilities were designed for players of all skill levels. Private instruction is available to both members and guests. A tennis pro is on hand from 9-11 a.m. daily for both the men’s and women’s supervised program. Tournament play can be arranged by the on-site pro through the Collier Tennis Association. Eagle Creek’s Junior Olympic-sized pool and heated spa are open during daylight hours seven days a week. The Fitness Center and Studio offers two separate health and exercise venues. The Center has both cardio and strength training equipment. Fitness classes are held at the Studio. The rest of the regular social scene include a bocce league with over 100 members and Game Nights at the clubhouse, including bridge, poker, and other card games, as well as bingo. When it comes to convenience for life’s necessities, Eagle Creek lacks nothing because of its overall seclusion. Within less than a mile, groceries are available at Publix, The Fresh Market, and a Walmart Supercenter. Nearby restaurants include Panera Bread, Outback and Carrabba’s. Both Walgreens and CVS pharmacies are as equally close at hand. Situated between Naples and Marco Island, and the Gulf of Mexico, Eagle Creek is halfway to paradise in any direction.